Marsh, James H.. "Building the Canadian Northern Railway". The Canadian Encyclopedia, 25 January 2019, Historica Canada. https://www.thecanadianencyclopedia.ca/en/article/canadian-northern-railway-feature. Accessed 19 April 2019. One of the honoured guests at the celebrations for the new provinces of Alberta and Saskatchewan in 1905 was the "railway king of Canada," Sir William Mackenzie. One of the honoured guests at the celebrations for the new provinces of Alberta and Saskatchewan in 1905 was the "railway king of Canada," Sir William Mackenzie. Mackenzie was "highly pleased" by the concert and reception, where he mixed with the likes of Governor General Lord Grey and Sir Wilfrid and Lady Laurier. It was altogether fitting that a railway tycoon take part in those festivities, for the new provinces practically owed their existence to the railway. Through the 1880s the Canadian Pacific Railway reigned supreme in the West. But the CPR had been forced by political considerations to follow a route across the southern prairies that no sane business leader would have selected. As a result the CPR charged freight rates that were ruinous to many western farmers and it refused to build branch lines into the more fertile northern prairie. Any attempt to initiate competing ventures were quickly squelched the CPR lobby in Ottawa. Finally in 1895 that intrepid promoter of western expansion Sir Clifford Sifton proposed a new scheme by which governments might support railway initiatives with guaranteed bonds. No-one, least of all the CPR, showed any interest. Eventually Sifton persuaded an unemployed railway contractor, Donald Mann, to see some merit in the bond scheme. Mann partnered up with William Mackenzie and the two arranged government assistance in building a local line from Portage la Prairie to Dauphin, Manitoba. It was the beginning of one of Canada's most notorious business enterprises. Although born into the same Protestant Ontario backgrounds the two men were a study in contrasts: the solitary, sensitive Mann and the humorless, bullying Mackenzie. They met in the Rocky Mountains, where they gained a respect for the other's sharpness in a deal involving, legend has it, mules. Mackenzie was the deal maker. In order to procure his first railway contract he got his Catholic wife to persuade the Mother Superior of a Montreal convent to loan him the money. It marked the beginning of a financial career in which he would borrow hundreds of millions. Whatever might be held against the two promoters in the coming years, Mackenzie and Mann had an unflagging belief in the future of the West and of the potential of the northern prairie. With the aid of the Manitoba government they began construction of the Lake Manitoba Railway, expanded it to Lake Winnipegosis and then gained the right to build eastward to Port Arthur, on Lake Superior. In 1898 the two men amalgamated their various enterprises to form the Canadian Northern Railway (CNoR). Developers William Mackenzie and Donald Mann had hoped that the new Canadian Northern Railway would facilitate the transport of products from the fertile northern prairies (courtesy Canada Science and Technology Museum/CN002353). While Mackenzie and Mann were the first in years to show any interest in building more rail services in the West, they soon faced competition from Canada's largest railway company, the venerable Grand Trunk (GTR). The GTR tried to buy out Mackenzie and Mann and when that failed made plans to build another transcontinental. The CNoR fought off the challenge and rushed into its own plans to expand. On January 2, 1902, Mackenzie and Mann drove the last spike in their railway to Port Arthur. For his part Mann thought that building another line to the Pacific was "crazy," but it was a simple choice of surrendering to the GTR or going west. One great beneficiary of the CNoR's expansion was the city of Edmonton. 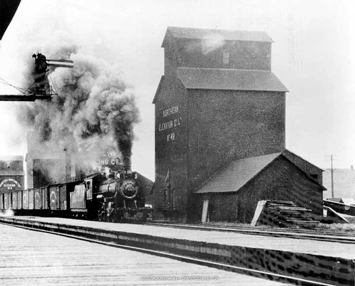 Although a branch line connected the city of Strathcona, on the south shore of the North Saskatchewan, to Calgary in 1891, the CPR stubbornly refused to cross the river. For ten years the city endured the frustration of being in sight of a railway that refused to serve them. When Mackenzie and Mann managed not only to cross the river but to bring in a fresh line from the east, they were seen nothing less than the saviors that delivered the city from the malevolent power of the CPR. The partnerships between the CNoR and various governments were an easy target for the press and for competitors and Mackenzie and Mann were frequently accused of fleecing both the public and their own company. The two pressed on and by 1909 the major contours of the prairie system were complete. Against their detractors they could point with pride at the more than 550 prairie cities and towns that sprang to life as a result of their railway. On January 23, 1915, in a hastily organized "last spike" ceremony at Basque, BC (near Kamloops) Mackenzie bent over to drive the now largely forgotten last spike of the CNoR. At that very moment of triumph, his railway was gasping for survival. Forced to expand too quickly, burdened with debt and threatened by the war that cut off immigration in 1914, the CNoR was taken over by the federal government in 1917 to form part of what became the Canadian National Railway. Mackenzie and Mann were disappointed in the recompense they received - neither died unduly wealthy. Worse, both the press and government reports impugned their reputations for "bleeding" the railway for profit. There is little historical evidence that they did and a great deal to show that their ambition and dreams played a great role in the development of the Prairie West. Railways and railway technologyPhotographs of equipment used by Canadian railways throughout the nation’s history. From the Canada Science and Technology Museum. Atlas of Alberta RailwaysExtensive online collection of maps, documents, and images pertaining to the major railways that ran through Alberta. From the University of Alberta.